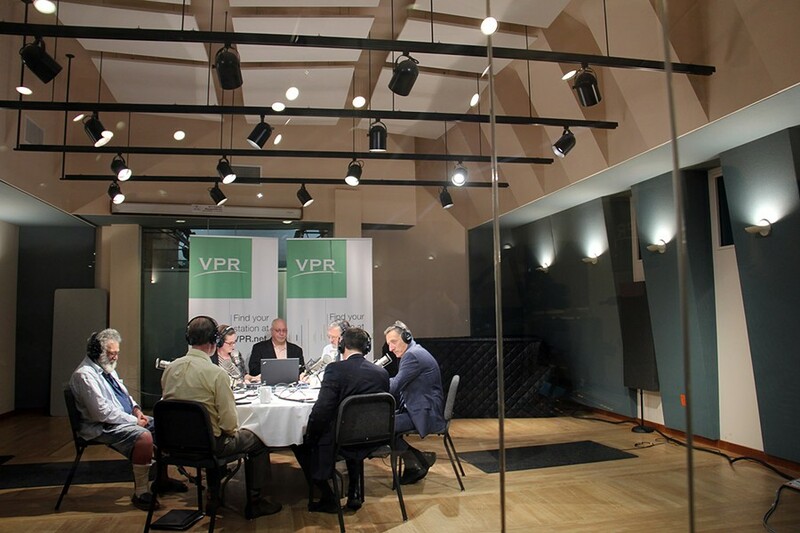 Gubernatorial candidates debate at VPR's Colchester studios. We here at Seven Days know you've got better things to do than listen to a 90-minute gubernatorial debate — things like monitoring the state's foliage report — so we're here to do it for you. What'd you miss Tuesday night when four candidates for the state's top job — the Liberty Union Party's Peter Diamondstone, Libertarian Dan Feliciano, Republican Scott Milne and Democratic Gov. Peter Shumlin — locked horns at Vermont Public Radio's Colchester studios? 1. Milne rarely answered the question. When he did, he occasionally gave two answers. After a weak performance 10 days earlier at the first gubernatorial debate in Tunbridge, Milne needed to accomplish one thing Tuesday night: reverse the solidifying perception that his campaign offers no real ideas. The Republican nominee failed to do that. Milne offered up dodgy, waffling answers to questions about health care reform, property taxes, renewable energy, the Vermont Gas pipeline, vaccinations and even marijuana legalization. "So I have a pretty good idea of what you don't like: You don't like single-payer," co-moderator Bob Kinzel said to Milne early in the debate. "I don't have a clue, really, of what you do want. You explain the things that you don't like about Peter Shumlin's plan. Can you just briefly tell us, are you supporting the status quo?" "First of all, I wouldn't go so strong as to say I don't like single-payer," Milne responded, surely prompting fellow Republicans to throw their radios against the wall. "I think there's a possibility way down the road that single-payer could be something that makes sense to look at." Milne said that, "it's a very complex system and people at this table know more about it than I do." Then he meandered on for a bit, not really answering Kinzel's question. 2. Milne sounded tired, unprepared and exceedingly awkward. The Republican managed to sneak bizarre asides into many of his answers, commenting at one point that only he and Diamondstone were answering questions without referring to notes and, at another point, that he had won a straw poll at Sen. Bill Doyle's (R-Washington) Johnson State College class. The strangest moment of the debate came when Milne had a chance to pose a question to the incumbent. "Gov. Shumlin, I enjoyed, appreciated our debate at the Tunbridge Fairgrounds a little over a week ago," he said. "I've heard from four different people that there was some sort of an emergency sort of last-minute meeting Saturday night after that debate with Democratic leaders in Windsor County that you attended. I'm just curious: At that meeting, how many of the folks that were there, I guess to help you sort of regroup after that debate, work for the state directly, or work for nonprofits or advocacy groups that are funded by state dollars primarily?" "Scott, I'm totally unaware of what you're talking about and that doesn't usually happen to me," Shumlin replied, explaining that he had made separate trips that Saturday to a Vermont State Employees Association conference in Killington and a Windsor County Democratic Committee meeting in Hartland. "The meeting that you're referring to did not happen." "Okay, my bad," Milne said. "Thank you." "No follow-up question to that?" Kinzel asked. 3. Shumlin sounded confident and smooth, and he managed to leave his trademark cockiness at home. Kinzel and co-moderator Jane Lindholm directed some tough-as-nails questions at the governor, but he managed to answer them without sounding too defensive. Shumlin made effective use of the questions he posed to his opponents. His first, directed at Feliciano, basically invited the Libertarian to differentiate himself from the Republican. His second, directed at Milne, challenged the Republican to explain which of the Democrat's policy priorities — universal pre-kindergarten, affordable college tuition, a higher minimum wage, GMO labeling and fighting opiate addiction — he considered "radical" and which he'd try to repeal. "I think the GMO labeling bill is a good example of a radical, progressive management of a bill by your administration," Milne said, prompting the governor to ask, "So of all that list, you would repeal GMO labeling?" "I didn't say I'd repeal it," Milne explained. "I'm not even positive I would've vetoed the bill if I was in your shoes." "So you're against it, but you're for it?" Shumlin interjected. "No, no," Milne said. "You can do— You know, I can do that flip-flop thing on you. You know, I'm running a debate on ideas. I'm running a campaign of ideas. I've got some great ideas. And I'm not doing soundbite, flip-flop stuff." 4. Diamondstone and Feliciano were remarkably consistent. The former argued that capitalism is "evil," while the latter answered most questions by saying that the unfettered free market would solve pretty much everything. If you're into ideological purity, these are your guys. Feliciano's libertarian armor cracked just once, when he was pressed by Diamondstone about whether he would legalize all drugs. Noting that he has "small kids" who "ride bikes in the street" and that he wouldn't want to see them injured by a drug user, Feliciano said he wasn't so sure and would have to get back to the Liberty Union candidate. Overall, Feliciano turned in a far stronger performance than Milne. 5. Milne and Feliciano don't think the government should invest in fighting climate change, while Shumlin is already walking back his support for divestment. Acknowledging that "climate change is a reality," Milne said, "We want to be responsible citizens, but the government can't be sticking its neck out and getting too far overboard on spending money on this." Feliciano wouldn't even go that far. "I don't think climate change is as big an issue as we're actually making it," he said. "And as small a state as we are, I don't think anything we can do is really going to impact it as much as we think it's going to be, so I don't think it's really that big of an issue right now." As for Shumlin, the governor appears to be retreating from his assertion during an interview on WDEV's "The Vermont Conversation" last week that divesting state pension funds of fossil fuel investments is "a good idea." When Feliciano asked about those comments, Shumlin said, "What I said about divestiture is I'm willing to take a look at it. I didn't say I would call for it." 6. Only in Vermont would all the major gubernatorial candidates signal that they'd sign marijuana legalization into law. Diamonstone and Feliciano are all-in on marijuana legalization. Shumlin hemmed and hawed a bit, but the gov left the distinct impression that, like his competitors, he would sign a legalization bill. As for Milne? He managed to take every side of the issue. "I do not advocate for legalization of marijuana in the short term. I think it's a bad idea, but I think... one of the three fundamental principles upon which I founded my campaign is: the more locally decisions can be made, the better," he said. "So if you're listening and you think marijuana should be legalized, I would encourage you to talk to your legislators. I'm not going to advocate for it. I'm not going to pressure people. If I get a bill, I will sign it. But, on the record, I think it's a bad idea to rush into it. I think we should have more states go through it. It's clearly a train that's coming our way, but no sense jumping on too soon." 7. Bob Kinzel and Jane Lindholm won the debate. The two asked smart, tough questions — and sounded infinitely more informed than most of the actual candidates. I made a similar point two years ago, but, man, is it too late to nominate them for governor? You can listen to the full debate by clicking here.